A New Ovibovine, Symbos convexifrons, sp. nov. In Bulletin 25, entitled The Musk-oxen of Nebraska, the writer figured and briefly catalogued the ovibovines of this State as known at that date. In the meantime an interesting new form unlike that of any species falling within our experience presents itself from the Pleistocene of Cherry County, Nebraska. The new specimen cannot be assigned a place in any of the four following genera: Preptoceras, Euceratherium, Ovibos, or Bootherium, but may possibly be referable to the genus Symbos, to which we are assigning it provisionally. It is so unlike Symbos, however, that it may be a distinct genus. The character of Symbos cavifrons, as the name implies, is its deeply concave front in which the concavity may equal 1% inches or more. As usual, however, there is a considerable range of variation with which to reckon. Sufficient comparison shows that the front of Symbos cavifrons varies from fairly convex, to deeply concave, the prevailing condition. Antithetically, the character of the new specimen is its convex front, in which the convexity equals 1% inches. Accordingly, we are proposing for the specimen under consideration the name Symbos convexifrons. The name may serve also as a mnemonic. The skull seems to be a trifle smaller than that of Symbos cavifrons. The brow of this specimen is notably convex, and this, coupled with the slope, length, and sweep of the horn cores, constitutes the main feature of this new species. 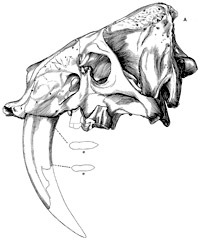 In the case of Symbos cavifrons, the exostosis and the horns were confluent across the head; in Ovibos moschatus they virtually met on the median line, but in fact always preserved a deep narrow groove between; while in Symbos convexifrons the horns rise from the side of the head, after the manner of bovines, as may be seen in the accompanying figure. The horn cores are not so flattened above and do not droop so abruptly downward as they do in Symbos cavifrons and Ovibos moschatus .. besides, they are longer and much more divergent. They are broad and inflated at the base, taper rapidly, slope gradually downward, forward, distinctly outward, and curve upward but slightly if at all. They measure 24 inches from tip to tip, or about 26 inches or more with the tips restored, whereas Symbos cavifrons measures but 16 to 18 inches and the length on the outer curve is about 10 inches.